Celebrating ten years of original restored vintage lighting, we’re gearing up to preview pieces from our AW19 Iconic Designs collection among other newly reclaimed and refurbished finds at a three-week showcase in London’s creative design hub in central Clerkenwell between 13-31 May 2019. The pop up at the MARK Product showroom will feature classic and timeless lighting designs from renowned lighting brands of the 20th Century including Heyes of Wigan and Simplex. Elsewhere the showcase will include 1950s hand-blown opaline glass lights salvaged from former Czechoslovakia (pictured, above), a one-off 1920s antique copper pendant with foxed glass detailing that was once used to illuminate high-end shop displays, and statement munitions store lights originally installed at a mine in Fife, Scotland. 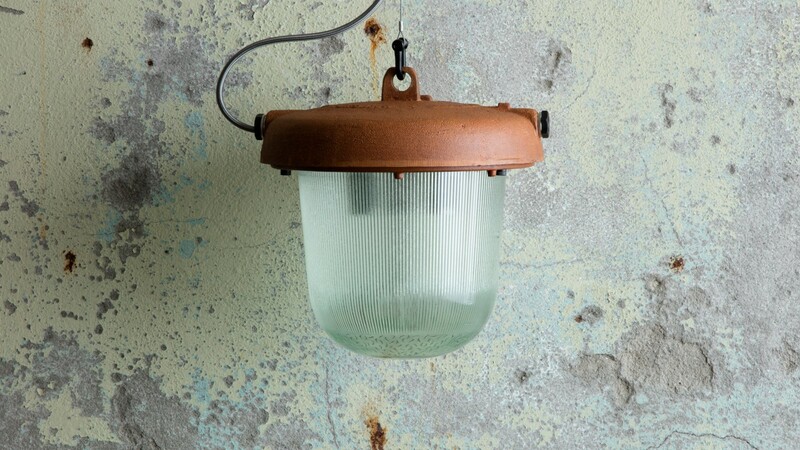 As with all the lights that we salvage and restore at skinflint, each light has been sensitively refurbished by its team of UK-based lighting experts with the founding principle of preserving the interesting surface patina, heritage and story of each piece. The pop up coincides with our extended opening hours for Clerkenwell Design Week (CDW) where we’re excited to be hosting ‘Right to Repair’, a panel event exploring mending and restoration at 4.30pm on Tuesday 21 May. Chaired by design journalist Katie Treggiden, skinflint co founder Chris Miller will join V&A artist-in-residence Bridget Harvey to explore visible mending, the stories in restored objects and design for repair. Read more about the talk here. Following the talk, CDW registered attendees are also invited to join the skinflint showroom after party with a drink from 6pm-9pm. Please RSPV to confirm your spot at the ‘Right to Repair’ panel talk and the skinflint showroom afterparty, full details below. New and existing clients are invited to make a consultation appointment throughout the three-week pop up with our team at [email protected]. Please RSPV to confirm your place at the ‘Right to Repair’ panel talk and the skinflint afterparty.